The Freeze Dry Storage Area Racking has been designed for a major international client working in the nutrition sector. The racking will store tools for the freeze dry area whilst they are not being used. The unit has been manufactured using 60 x 30 rectangular section and 30 x 30 box section with a thin wall to provide an optimum strength vs weight solution. Mild steel sheet has been welded to the box section for the shelves. The unit also features side panels, top panel and back panel which are riveted on. The unit features two handles on the front of the unit at each end to allow the operator to move the unit easier. The unit features 6 castors, 4 swivel with brake and 2 swivel which feature an elastic rubber tyre on nylon centred wheel. The unit has swivel with break castors to improve manoeuvrability for the operators. 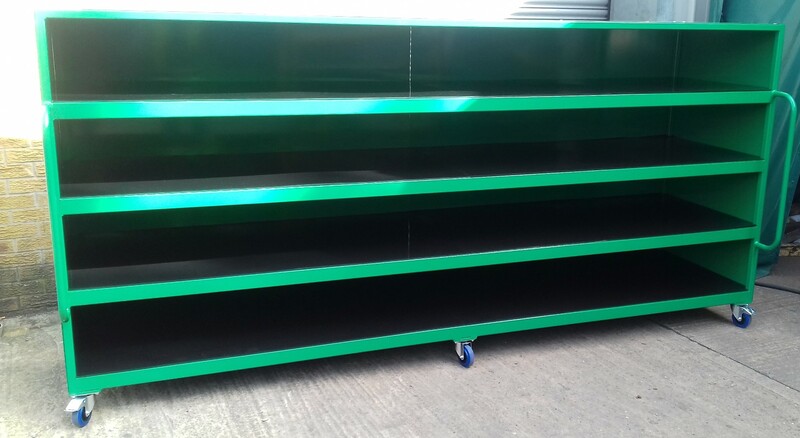 The unit has been powder coated in Green RAL 6029 to provide a hard wearing, long lasting finish.